This recipe is native to Punjabi cuisine. 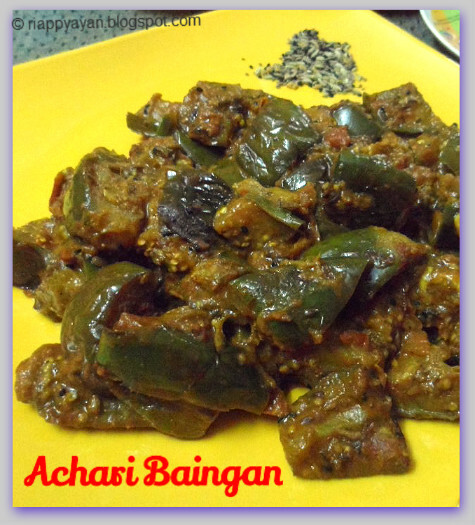 The word 'Achar' means Indian pickle and 'Baingan' means eggplant/aubergine. 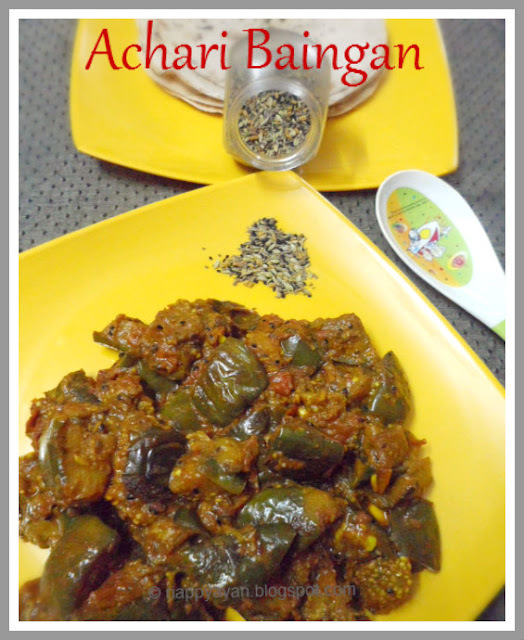 When you hear the word 'Achar' in the name of the recipe, it is quite natural for many people to think this dish is made with pickle or the other way, a pickle made with brinjal. But as the name suggests, it does not use any actual achar or pickle. The spices are used both in this recipe and a pickle are almost the same and surprisingly, the taste of this dish is quite close to a Indian achar or pickle... spicy, tangy and pungent. Ginger-garlic paste : 2 tblsp. Amchur or Dry mango powder : 1 tblsp. Chop the brinjals in big chunks. Take them in a bowl. Add 1/2 tsp. of turmeric and red chilli powder, salt and 1 tblsp. ginger-garlic paste, mix well with brinjals, so all brinjal are nicely coated with the spices. Keep aside for 15-30 minutes. More the merrier, 30 minutes is enough. Heat 2 tblsp. oil in a pan, add marinated brinjal pieces and saute in medium flame until they are light brown in color. Drain on a kitchen towel. On the same pan, add little more oil, temper with panch phoron or five spice mix. When seeds crackle(do not burn the seeds, otherwise the curry will taste bitter), add chopped green chillies and onions. Fry till onions turn brown, add 1 tblsp. ginger-garlic paste, turmeric, red chilli powder and coriander powder and chopped tomatoes. Saute till tomatoes softens and spices are nicely cooked, add fried brinjals and dry mango powder. Add sugar and salt to taste. Now add just enough water to cook the brinjals about 2/3 cup or as needed. Cover and let it cook. Be careful not to overcook the brinjals. When water evaporates and brinjals are done, remove from heat and garnish with chopped fresh coriander leaves. Serve with rice or pulao or any Indian flatbreads like naan, paratha or chapathi. Baingan looks delicious. Nice flavors. Looks very tempting.. Flavorful one ! Very tempting , bookmarked it.